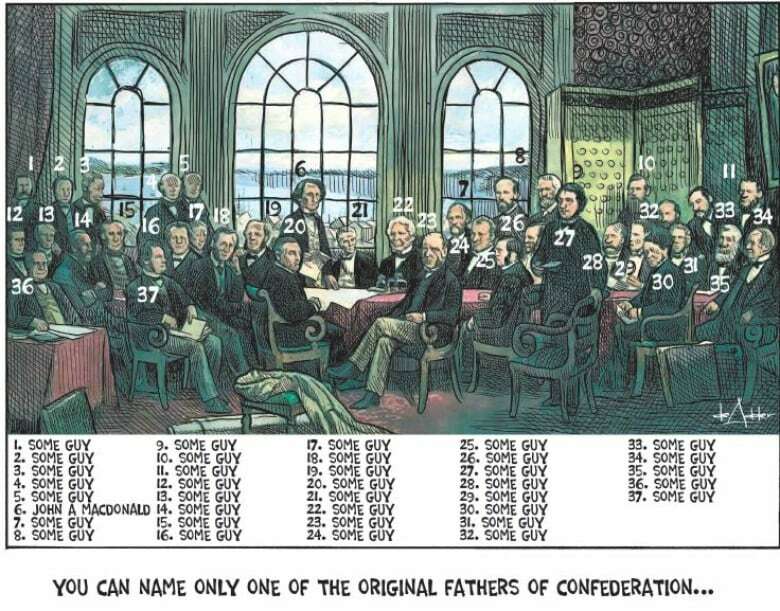 Some of the new comics, like this one of the Fathers of Confederation, came out better than de Adder had hoped. (Michael de Adder)What makes a Canadian, Canadian? Is it double-double coffee and ketchup chips? Is it a love of Rush — or maybe a hatred of Rush? He admits it was a struggle to find truely universal themes, with a few exceptions: "I think we have a good sense of humour... and I think we have a stronger desire to help our fellow Canadian." De Adder's book contains 120 cartoons, most of which are brand new. "Usually with an editorial cartoonist you put together collections of work. This was another beast entirely, I had to write this out of thin air. Ninety-five per cent of the illustrations are just for this book." Despite trying to keep the book apolitical, de Adder admits some of his commentary did slip into its pages. Including the second cartoon, titled "It's not your 150th birthday." "It's a statement on: it is Canada's 150, but the reality is Confederation in 1867 — there were only four provinces: Ontario, Quebec, New Brunswick and Nova Scotia. So the vast majority of Canada wasn't a part of Canada in 1867." "I wanted to address it right off the bat with my book." Hear more of his conversation with The Morning Edition's Craig Norris.